The G-Com 2066 CDMA will intercept, record, and play back cell phone conversations in a CDMA mobile phone network. 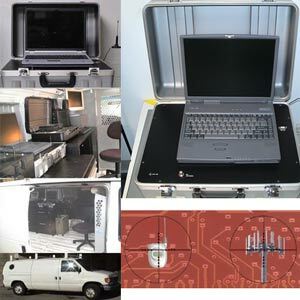 It is used by law enforcement and government agencies to monitor and store cdma cellular phone conversations of suspected criminals, militants, terrorists, and those committing espionage. The G-Com 2066 CDMA will also capture SMS (short message service) data. It is a passive system -­ no signal is transmitted from the system and the cell phone network receives no electromagnetic interference. The system operates by automatically detecting the strongest signal in a CDMA service area. The system intercepts control channels and both sides of a conversation through traffic channels. *All specifications are subject to change without notice. Photos are for illustration purposes only. Actual system may vary. ** Please Note: This website is intended only as a proprietary notice and does not constitute an offer to sell surreptitious intercept devices. Such an offer to sell can only be made by an official HSS proforma invoice signed by an authorized agent of HSS under the constructor of the US code Title 18 Section 2512. © Copyright 1995 - 2017 HSS Development. All rights reserved worldwide.